We been struck by a peculiar disease: that of a profound awe and respect for the law and an insatiable desire to distribute legal information to everyone, not just barristers, solicitors, lawyers, attorneys, law students or judges. 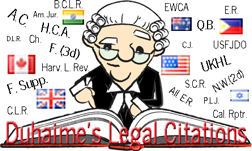 In our view, there does not exist, online, a satisfactory compendium of legal citations and abbreviations, one which is both alive and presenting content which takes full advantage of the technical and esthetic capabilities offered by the Internet. Cardiff University has one but though it is fairly complete, it is dated (it has few of the modern neutral citations and it doesn't include acronyms of major legal organizations) and it is very dull (click here to check out the Cardiff University Legal Abbreviations website). Duhaime's Legal Citations & Abbreviations was started in December of 2009 and will take a tremendous amount of support, encouragement, work and dedication.